Planning to skip the pubs and have a laidback weekend, perhaps with a movie or two? Traditional single screens to posh multiplexes, there are cinema halls aplenty to pick from. Whether you’re looking for budget-friendly ones or something fancier, we’ve picked out some of the best in the city, offering everything from cosy (read couple) seating and grub to picture clarity and 3D. Go on, be filmy! Going that extra mile to promise you a great movie-watching experience, Cinepolis is known just as much for its picture clarity as for its comfortable seating (with ample leg room!). Considered Bangalore’s first fully digital and 3D multiplex (the one at Royal Meenakshi Mall), the sound technology and relatively bigger screen size just take things up a notch. What’s more, they even have tickets for as less as INR 120 and INR 150 on certain days! For those who’ve grown up watching movies at Urvashi, its new avatar might probably have been a pleasant surprise. Among the first single screen halls in the state to introduce Digital and 3D projection, we love that they still stick to affordable ticket rates. Whether it’s to watch a spine-chilling horror movie (even those basic jump scares might startle you here) or the recent SRK flick, this one’s worth bookmarking. While you’re at it, get a pack of French Fries to munch on as well. While Everest Theatre might not match up to the multiplexes when it comes to the technology, watching a movie here is an experience. It’s all about old-world charm, you see. Apart from the Hindi and Tamil movies that they mostly play, they screen Indian and international documentaries on the last Thursday of every month (collaborating with the filmmaking collective, Vikalp Bengaluru). Join in the whistling and clapping when a star appears on screen without batting an eyelid, it’s encouraged. Nearly broke but don’t want to miss that new flick starring your favourite actor? Head to Cauvery without a second thought. Screening regional (Kannada and Telugu mostly) and Hindi movies, this old-school single screen is best known for its pocket-friendly rates, throughout the week (yes, weekends included!). Pick from the Balcony, Mini Balcony and First Class seats here and settle in, with some budget nibbles from the snacks counter. If you don’t mind dishing out a little more money for comfort and better infrastructure, INOX is a great option. With multiplexes spread across town from Whitefield to JP Nagar, you’re bound to find one near you. From the comfy seating and food options (go for their Nachos with some extra cheese dip) to the acoustic system, this one offers a rather indulgent experience for those weekend movie outings. Keep an eye out for their deals on tickets and munchies. Whether it’s an all-new Rajinikanth flick or the latest Hollywood release, Rex theatre is a popular option among movie buffs. Built in the time of World War II (known as The Paul’s Rex back then), this humble single screen has stood the test of time and how! If that isn’t reason enough for you to head here, then perhaps, the cosy setting (perfect for a fun movie day with your friends or an old-fashioned date) and the varied snack options (think Kathi rolls, momos and popcorn) might do the trick. This classic one is shutting down soon, so head there ASAP! Want to take your movie spree up a notch? Look no further than PVR‘s multiplexes. From the one at Forum Mall (Koramangala) to the swanky new one at VR Bengaluru (3D is ace), a movie here is quite an experience. Apart from the cool IMAX, their Director’s Rare screenings of alternate or independent movies, and Gold Class seatings (with private screenings, too) for the particularly indulgent movie-goers are other features to look out for. Their morning shows are perfect if you really don’t want to burn a hole in your pocket. 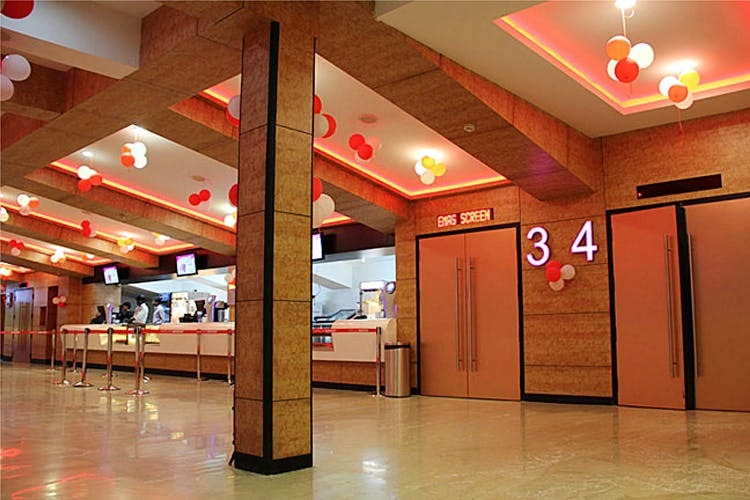 Not too high on ambience or infrastructure, Lavanya is for when you want a fun time at the movies. Think whistling, cheering and loud comments that are a part of screenings at many oldschool single screens. Screening mostly Tamil movies, they don’t have online booking. So, be prepared to join the queue and maybe even jostle a bit for your tickets. While Gopalan malls may not really be on your list of hangout spots, hit them up if you want to finish off a day of lazy shopping with a movie. With Sofa and Gold seating options, Gopalan Cinemas has a nice blend of comfort and picture and sound quality. Keep an eye out for their weekday discounts on tickets. This one definitely is a public favourite. With grand and luxe looking screening halls, The Cinema is a must-visit. Originally owned by SPI cinemas, now taken over by PVR, this theatre is well known for its yummy unlimited popcorn toppings. The tickets on weekdays are as low as INR 115, and the experience is worth every single penny!